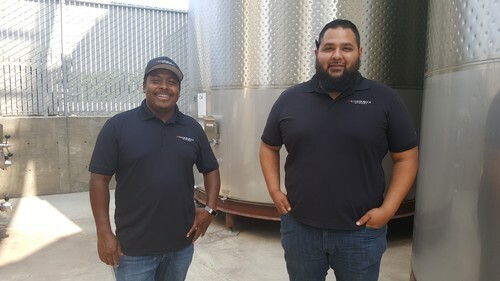 Joseph Smith, left, and Chris Rivera comprise the winemaking team at Klinker Brick Winery. Joseph Smith and Chris Rivera are the winemaking team at Lodi’s renowned Klinker Brick Winery. Smith hails from the Caribbean nation of Belize, while Rivera’s parents immigrated to the U.S. from Michoacán, Mexico. Smith has been Klinker Brick’s winemaker nearly 10 years, and Rivera has been his understudy the past four years. Together, their passion and talent have helped Klinker Brick experience phenomenal growth behind a diverse lineup of premium artisan wines. Not only is Klinker Brick Winery a favorite destination for visitors to Lodi, their wines are distributed and enjoyed throughout the United States and overseas. Smith and Rivera not only share Latino heritage, their stories are similar. Both put themselves in position through perseverance and hard work to take advantage of life changing opportunities. Smith left Belize to work for a relative’s construction business in Southern California. He was in his late teens/early 20s at the time and had no knowledge about wine, coming from Belize, where cocktails and beer are the norm. While working on a construction project in Lodi, Smith crossed paths with noted winemaker and consultant Barry Gnekow, who counts Klinker Brick among his clients. This proved to be the break Smith needed to enter the wine business. Smith apprenticed under Gnekow and worked his way up to cellar master and eventually winemaker at Klinker Brick. Rivera grew up in Modesto the son of naturalized U.S. citizens and graduated with a degree in sports science from University of the Pacific. Rivera worked as a physical therapist out of college and decided to further his education. He took a job with E & J Gallo in Livingston to earn money for graduate school. While there, Rivera said he was bitten by the wine bug. Rivera knew if he wanted to be a winemaker, he would need to land with a smaller winery where he could gain the practical experience he would need. Rivera sent out feelers to a lot of different places and Klinker Brick was the first to give him a chance. Joseph Smith, left, and Chris Rivera, second from left, discuss plans for a new project with Farrah Felten-Jolley and Stefan Jolley. Smith said Rivera reminded him of himself when he was looking to break into the business. Rivera said he came to Lodi unsure of the reception he would receive, but he said the Lodi wine community has been accepting and a good place to work. 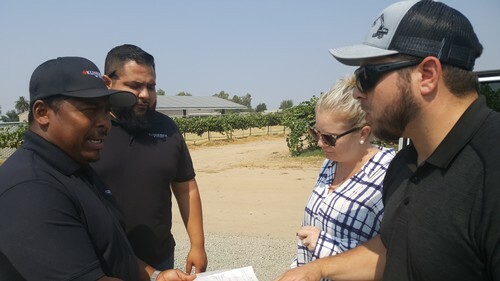 Rivera said Lodi is becoming a more innovative and diverse winemaking community and counts winemakers Susana Rodriguez Vasquez from Peltier Winery and Bokisch Vineyards’ Elyse Perry among his valued colleagues. Farrah Felten-Jolley said it’s been great to have Smith and Rivera at Klinker Brick.